I've been working on Sweet Treats a little bit the past couple of days. Things have been a little hectic lately! Have I mentioned that I can't wait until this summer?? Sweet Treats is coming along nicely. This is such a cute design. Sweet Treats is looking really great! I am so glad that the summer is coming and that soon you will be in your new home!! 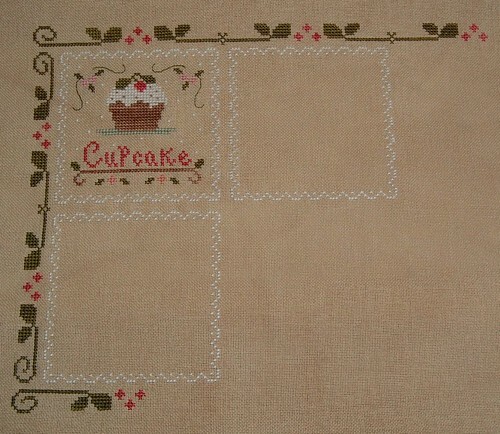 Did you start your Sweet Treats over or were you able to use the border that you had already stitched? I bet lots of stitchers had to frog with the error in the pattern. Yours is looking really pretty! Just think, as of tomorrow, you will be able to say that you are moving "next month" :) - you are moving in June, right? Sweet Treats is looking fantastic! And I am glad you left off the buttons on Cupcake so far, as I will be stitching this set over 1 on 25 count fabric and was concerned the buttons would not fit. Now I know I can leave them off if need be, except, of course, for the actual Sweet Treats block where the buttons are right in the middle. Your Sweet Treats is looking so cute-much nicer than the chart picture! Aren't the CCN and LHN designs so fun? This design is too cute! It is coming along nicely! Great progress. I can't wait for summer either! 22 dyas of school left!